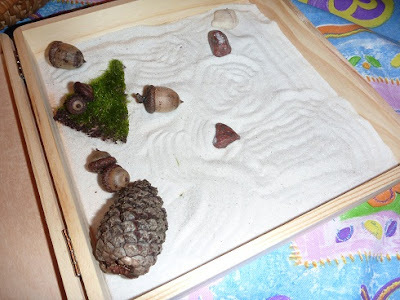 Yesterday, I showed the kids a few pictures of Japanese Zen gardens before we settled in to make our own. We listened to a couple of beautiful Japanese pieces as we worked on our Zen gardens. We used sand and a few objects I had on hand for the kids (rocks, acorns, fake grass, pine cones). We used forks instead of rakes. DD and ED wanted to do it again this evening. 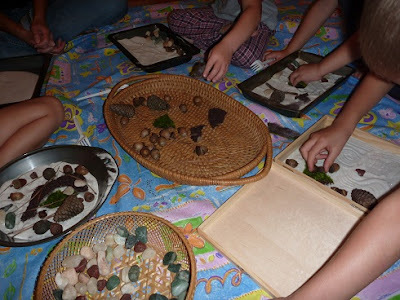 The kids really enjoyed this and I’ll bring this activity back out in the next couple of weeks with fall objects as we move into our fall-themed unit. The pieces we listened to were: Cherry Blossom and Song of Four Seasons which were both recommended by a Japanese friend of ours.